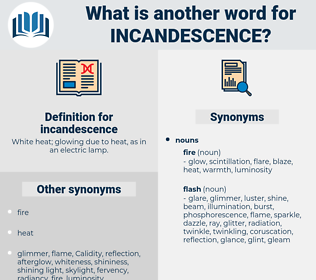 What is another word for incandescence? 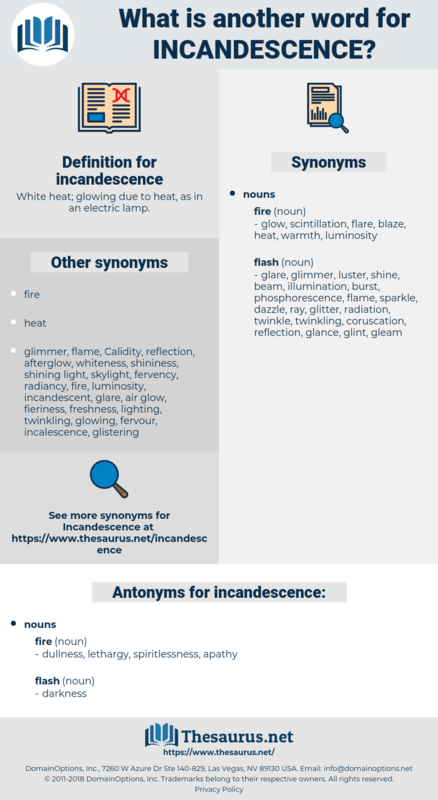 White heat; glowing due to heat, as in an electric lamp. cold, frigidity, cool, coolness, chill, disinterest. misunderstanding, eventide, dimness, misconception, night, sundown, sunset, obscurity. duskiness, shade, dusk, blackness, gloom, shadow, gloominess. He was white, and tremendously shaken, while gleams of incandescence burned deeply in his eyes. The site of the mill, the squares where the piles of lumber had stood, glowed incandescence over which already a white film was forming. brightness level, luminousness, light, luminance, brightness, luminosity. visible light, visible radiation, light.